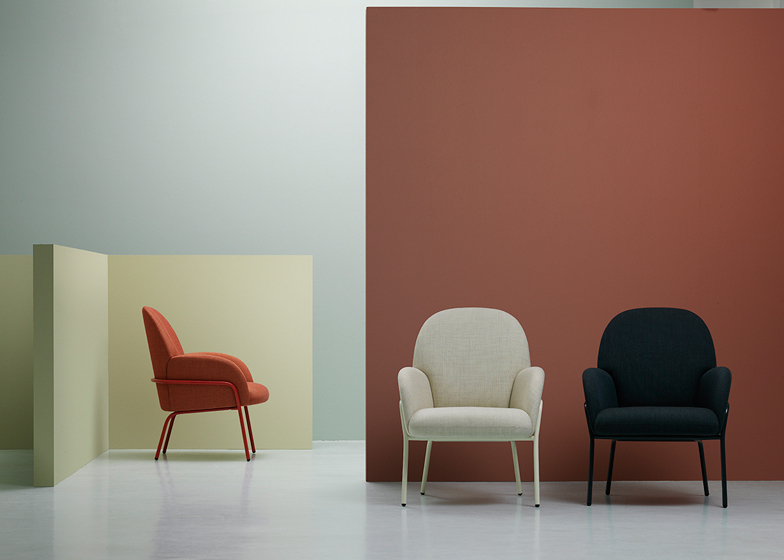 Stockholm 2015: Stockholm-based Note Design Studio has reduced the dimensions of a typical lounge chair so that this seat for Swedish brand Fogia will fit into increasingly smaller homes and offices. Designed for more compact living and work spaces, the Sling seat by Note Design Studio is formed from upholstered cushions that nestle within a metal frame. "It should have high comfort but still be smaller than a regular lounge chair, to meet the increasing need of good furniture for small spaces," said Note Design Studio co-founder Cristiano Pigazzini. The frame curves around the rounded arms and backrest, creating the impression of a supportive strap from which the design takes its name. "The result is a distinct armchair, with visible contrasts of hard and soft from every angle," Pigazzini said. Textured fabrics used to cover the cushions are available in a range of hues, with the four-legged base coloured to match. "In the design process we focused on making a piece of furniture with a gentle look, where we tried to emphasise all the details without any over design," said Pigazzini. The lounge chair is Note's second seat design for Fogia, following a sofa with a wooden base that extends outwards to become a side table – launched last year. Sling will be presented at both next week's Stockholm Furniture Fair and the studio's Domestic Science event in the Swedish capital on 3 February. Note is also debuting a series of lamps wrapped in pastel-coloured textiles at the same events, taking place during this year's Stockholm Design Week from 2 to 8 February. Photography is by Mathias Nero.